• As you explore auditory phenomena, you'll again be reminded of the distinction between physical and perceptual phenomena. There is a definite linkage, as illustrated in the table below, but it is by no means a simple nor a direct one. • We're now discussing a sense other than vision, so you should begin to think of comparisons between audition and vision. For this chapter, focus on the physical stimulus (sound vs. light) and the transduction sites (inner ear hair cells vs. retina). In what ways does audition differ from vision? Consistent with Theme 1, you should also note similarities between audition and vision. Moreover, you should begin to think about ways in which audition and vision interact with one another. • The visual stimulus is light energy from a segment of the electromagnetic spectrum, ultimately transduced by photoreceptors in the retina. Auditory stimuli are created by objects (e.g., a human speaking, someone playing a musical instrument, a tree falling in the forest) that produce changes in pressure in some elastic medium (typically air, though other elastic media work as well), ultimately transduced by hair cells in the inner ear. The sound-producing object often vibrates, causing molecules in the elastic medium to become more dense (compression) or less dense (rarefaction). Link - Acoustics.org has links to many web demonstrations of waves, including those by Victor Sparrow (Pennsylvania State University) and Dan Russell (Kettering University). Link - You can also learn more about digital signal processing by exploring Steve Smith's online text. • Demonstration 9.1 Frequency, Amplitude, and Phase Angle of Sound Waves You can construct a simple "musical" instrument to illustrate the three properties of sound waves that we're about to discuss. Simply stretch a rubber band over an open box. By plucking the rubber band gently or vigorously, you can vary the amplitude, or height, of the sound waves. Note the associated changes in your perceptual experience of the sound that accompany changes in pluck vigor. By adjusting the tension on the rubber band (pulling it more tightly or less tightly against the side of the box), you can vary the frequency of the sound waves. Finally, by pulling up on the rubber band, you can cause the sound wave to start 180° out of phase with a wave initiated by pushing down on the rubber band. • Frequency (typically measured in Hertz, Hz) is the number of cycles in a sound wave per second. As illustrated in the demonstration below (for 220, 440, and 880 Hz), in the same unit of time, a higher frequency would have more complete waves than a lower frequency. Although the relationship is not simple, generally the lower the frequency, the lower pitch a person will perceive. The higher the frequency, the higher the pitch a person will perceive. • Demonstration 9.2 Hearing Different Frequencies To hear what each of the three frequencies sounds like, click on the figure. The A above middle C is 440 Hz, and that is the note typically used for tuning. An octave represents a doubling, so 220 Hz and 880 Hz are also As, below and above 440 Hz. • Amplitude refers to the amount of energy in the wave (intensity), indicated by the height of the wave. Generally speaking, the greater the amplitude, the louder the sound. Once again, however, the relationship is not a simple one. For the four tones in the demonstration below, the frequency is constant (A = 440 Hz), but the amplitude decreases from one tone to the next. • Demonstration 9.3 Hearing Different Amplitudes As illustrated in the four figures below, the frequency is constant (440 Hz). However, the height of the wave gets smaller with each successive wave, indicating less energy in the wave. Click on each figure to hear the differences in amplitude. • The outer ear is comprised of the pinna (given the Latin origins, the plural is pinnae) and external auditory canal (also called the external auditory meatus). The eardrum (also called the tympanic membrane) marks the transition between the outer ear and the middle ear. • Demonstration 9.4 Difference in Impedance for Air and Water For this demonstration you'll need to be in a swimming pool (or a less satisfactory substitute, a bathtub). First, note that sounds that are easily heard with your head above water are almost impossible to hear with your head below water. The greater impedance of water causes most of the energy in sound waves to be reflected. Notice, too, that you can overcome the impedance mismatch if you can make the pressure changes directly on the water. To illustrate this point, have a friend outside the pool take some long object (e.g., a piece of metal) and bang on it with another object. You will not likely hear the pounding if your head is below water. Next, have your friend place the object directly into the water and bang on it. It will now be much easier to hear the banging when your head is under water. Link - Outer hair cell (OHC) motility is illustrated in a QT movie made available by the House Ear Institute. You can also view OHC motility at the Yale Ear Lab (Joseph Santos-Sacchi), along with musical accompaniment. • Presbycusis (also called presbyacusis) refers to the loss of high-frequency hearing abilities that accompanies the aging process (and exposure over time to loud noises). Link - If you'd like to get a sense of the impact of hearing loss on perception of a variety of sound stimuli, check out the demos at the Phonak site. Link - If you can use the Windows OS, you can make use of Hearing Loss Simulation software from CDC/NIOSH. • Could you be an effective percussionist if you couldn't hear? Apparently at least one person can. You may want to check out the following documentary film: Touch and Sound (2004). Evelyn Glennie lost her ability to hear when she was young. She had early interests in music, which eventually focused on percussion. You'll be impressed with her performance (especially on vibes)! • The decision about whether or not to receive a cochlear implant is addressed in the documentary film Sound and Fury and a follow-up film Sound and Fury: 6 Years Later. 1. Describe the auditory stimulus with respect to frequency, amplitude, phase, and complexity. Then turn back to Chapter 3 and compare the auditory stimulus with the visual stimulus. For instance, how do the perceivable auditory and visual stimuli differ in frequency? 2. Draw a rough sketch of the auditory system, identifying the parts of the outer ear, middle ear, inner ear, and the pathway from the inner ear to the auditory cortex. Point out the similarities between the higher levels of auditory processing and the higher levels of visual processing. 3. The organ of Corti should strike you as quite different from the retina, yet both structures perform similar transduction functions for audition and vision. Describe the similarities and differences between the two structures. To what extent do you think the differences are due to the nature of the differences between the auditory and the visual stimuli? What might be the source of the similarities between the organ of Corti and the retina? 4. You might think of the auditory system as a type of game. The goal of the game is to deliver the auditory stimulus to the receptors so that the dB level is as high as possible. Points are lost because of some events, and points are gained because of other events. Describe this “game” with particular attention to the obstacles (e.g., impedance mismatch) and the means of overcoming them. 5. Discuss the two kinds of hair cells and the functions they serve in providing our auditory experience. 6. Inserting a microelectrode into the auditory nerve is a procedure very similar to that used in studying the activity of ganglion cells in the optic nerve. Work through the similarities and differences between the activity in the auditory and optic nerves. Do you think that there is any equivalent of the cochlear microphonic in the visual system? 7. Compare the visual and auditory pathways in the brain, focusing on the nature of the information and its organization in each sensory system. Be sure to discuss the points at which information from the two eyes can be compared and the points at which information from the two ears can be compared, and why such comparisons may be important. 8. Tinnitus might be confused with otoacoustic emissions. Given the definition of tinnitus and the evidence on otoacoustic emissions, why would you argue that the two are different? 9. Suppose that you know two people who are deaf. One has conduction deafness and the other has sensorineural deafness. List various ways in which the perceptual experiences of these two people would differ. 10. A cochlear implant operation can cost between $40,000 and $60,000. (And batteries can cost as much as $300/year.) Costly as it is, the operation is not always completely successful. If you had a deaf child, would you want your child to undergo this operation? What arguments might you use to justify this costly procedure for your deaf child? Would your arguments change if you were talking about an older person who had recently become deaf? What do your arguments tell you about the importance of our auditory sense? Link - Perry Hanavan (Augustana College) has created a very helpful site: Virtual Tour of the Ear. Link - Barry Truax has provided an excellent on-line text with relevant chapters on the sound stimulus and the auditory system. Link - Ear Lab (Boston University) allows you to play with a model online and links to other sites, including some with models (Virtual Cell, GENESIS, Neuron). Link - American 3B Scientific has a number of different models of the ear, brain, etc. Link - Denoyer-Geppert produces a whole range of three-dimensional models, including models of the ear. Link - One group that is (or should be) very concerned about the damaging effects of noise is musicians. H.E.A.R. is an interesting site with information about the impact of (loud) auditory stimuli. Link - House Ear Institute has a number of useful pages, including access to library information and videotapes related to the auditory system. Link - Animation of Processes within the Ear (University of Wisconsin) provides some simple animations of processes in the middle and inner ear. Link - You'll find a good deal of relevant information at the Hearing & Balance textbook (University of Wisconsin). Link - Michael Mann (University of Nebraska) has placed his physiology textbook online, and it includes a chapter (Chapter 8) that discusses audition. Link - A research-oriented site provides helpful information regarding otoacoustic emissions. Link - If you want to learn more about cochlear implants, you may find the Minuteman Implant Club site or the Cochlear Implant Support site helpful. Link - Christopher Shera (Eaton-Peabody Laboratory) is a researcher interested in inner ear functioning (especially otoacoustic emissions), so you'll find his Earwicki site (Auditory Physics Group) of interest. Be sure to check out the hearing-related poetry found under Downloads. Fay, R. R. & Popper, A. N. (Eds.) Springer Handbook of Auditory Research (over 20 volumes on a variety of auditory topics). New York: Springer. Kent, R. D. (Ed.) (2003). The MIT encyclopedia of communication disorders (Vol. 4 Hearing is helpful for these topics). Cambridge, MA: MIT. Luce, R. D. (1993). Sound and hearing: A conceptual introduction. Hillsdale, NJ: Erlbaum. Martin, F. N. & Clark, J. G. (2005). Introduction to audiology (9th Ed.) Boston: Allyn & Bacon. Møller, A. R. (2006). 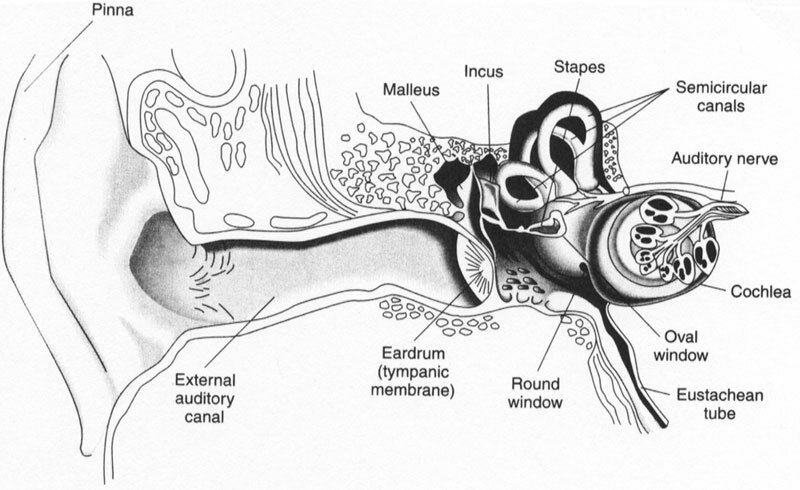 Hearing: Anatomy, physiology, and disorders of the auditory system (2nd Ed.). San Diego: Academic Press. Plack, C. J. (2005). The sense of hearing. Mahwah, NJ: Erlbaum. Rossing, T. D., Moore, F. R., & Wheeler, P. A. (2002). The science of sound (3rd Ed.). San Francisco: Addison-Wesley. Yost, W. A. (2007). Fundamentals of hearing, 5th Ed. San Diego: Academic Press.